Rhopalus parumpunctatus is a small, rather unobtrusive bug. There are some very similar other members of this family and usually it can be best separated from these by looking at the very tiny light edge and the bright and yellow point of the shield (the scutellum). Ordinarily it is some shade of darker brown, but the basic colour is quite variable indeed. It is some 6 or 7mm long. Many Rhopalid bugs are quite new in the fauna of Western and Nothern Europe. In most cases up to some 15 to 20 years ago this used to be a very small family in Western Europe, represented by only a few species. Probably due to the climate change many additional species have reached Western and Northern Europe. 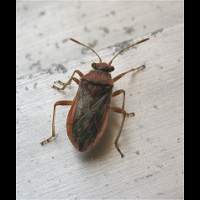 Just to mention a few Rhopalus subrufus, Brachycarenus tigrinus, Stictopleurus abutilon, Stictopleurus punctatonervosus en Corizus hyoscyami. Most of these have reached Britain as well. Rhopalus parumpunctatus fits perfectly in this line up. By the way many of these species do appear in gardens regularly and most of them are found easily.